"I have no expectations of how the gig in Tavastia on Saturday will feel. It will probably be the biggest audience we have ever had, although they will be further away than we have been used to when performing in front of smaller, more intimate, audiences," explains Arto Anttila, bassist and backing vocalist with the folk-pop group Elisa Laiho Acoustic Flow. Before beginning their scheduled rehearsal in Arto's home, the three members of Elisa Laiho Acoustic Flow have kindly agreed to talk about their involvement in the Irish Festival in Finland , reveal the inner-workings of the band and share their excitement over the launch of their first official CD single, due to be picked up at 1700 that same day. Once the seating arrangements had been agreed - beanbag for the bassist - Lissu Elenius (acoustic guitar and backing vocalist) began by telling me about the history of the group, "We are old friends from the Sibelius Academy, so we have all studied music in the same place. We have all known each other for six years." However, Arto and Elisa Laiho (lead vocalist and pianist) have been friends for 15 years after studying at the Kaustinen Music College together. "After playing in many different bands, it somehow happened that we all came together and started playing. It seemed that we had the same kind of visions, such as what type of music we like and what we would like to do in the future. At first, it was just Elisa and me; we thought maybe we could play together and then we asked Arto, so it would just be the three of us. It all started back in 2003," says Lissu. "Choosing the name was a long process," exclaims Lissu, bringing a great deal of laughter from Arto and Elisa. "It was very difficult to decide a name and it wasn't Acoustic Flow originally - Acoustic Flow has only been our name for maybe half-a-year. We especially wanted to use Elisa Laiho Acoustic Flow because most of the songs are composed by Elisa, she is also singing, so that's why Elisa Laiho Acoustic Flow. It is the whole name." One of the songs on the new single was inspired by 'He Wishes for the Cloths of Heaven', a poem written by the Irish poet William Butler Yeats. "Nowadays, I get inspiration from the text first, especially if I really like the text and I want to do it, then the composition comes soon after that. Sometimes I have just made some melodies and then found the proper text for it. I have written some lyrics, but I feel it is not my strength to do that, so I use other writers, different poets, and I have friends that write." "Usually I have to fix the structure of the poem because usually they are quite short, so I have to make a chorus and then we will repeat that. I may change something a bit, but I try to avoid that because it has to be quite original. It is very hard when the poet has died a very long time ago," laughs Elisa. "It is difficult to get in contact with them," jokes Arto. "I have changed the name of the Yeats' poem a little bit to 'Under Your Feet', or actually completely," she says before laughing once again. "It is a long story, but we have an agreement with Michael B. Yeats, the man that owns the copyright, but after three years this song is going to be free because it will be 70 years since Yeats died. We originally thought it was free!" After composing a song to some text, Elisa is joined by Arto and Lissu and they just start playing together making an arrangement of the new song, "We each bring different ideas of how this song could be, then, little by little, it starts to develop, but we are always listening to each other's ideas and playing," explains Lissu. "It is mixed in our heads. However, when you are making a record it means a more stable arrangement, so more consideration over the backing vocals is needed, for example," adds Arto. "When we perform live we have to change the songs because on the single we have extra instruments, such as the percussions and backing vocals that are sang by the same person, so we do have to make some diminished versions," comments Arto. "I think the structure of the songs remains quite the same and, inside the structure, we can improvise playing a bit differently, or doing improvisation with vocals, so it varies, but the structure remains the same unless we don't make a bad mistake," jokes Elisa. "One of the good things in this band is that you really can trust each other about the covering because playing is quite sensitive and anything can happen, like your string can break, and you just have to cope, but we can trust each other," observes Lissu and her statement is accompanied by the nodding heads of Arto and Elisa. 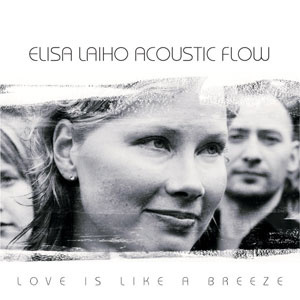 Elisa Laiho Acoustic Flow have performed approximately thirty gigs in Finland together, but they have all played abroad with different bands in countries such as Namibia, the United States, Germany, Switzerland, Sweden, Ireland and Norway. "The audience, for example, is very different abroad compared to Finnish audiences because Finnish audiences are quite quiet unless they are drunk, but then they can be quite noisy," thinks Lissu. "Audiences abroad are more open," adds Elisa before Arto concludes with, "You can feel the presence more." "If you sense a good reaction you want to do even better," says Lissu, although Arto is quick to add, "Of course, you are always trying your best in Finland or wherever." "It always has a lot to do with the feeling and whether we find a connection with the audience. In Finland, most of the time, we have had very, very nice audiences and good feedback; there is a warm reaction. This gives you more inspiration to do our thing, even though we don’t have a manager and it is quite a hard struggle, we made this CD and funded it by ourselves. It's not so easy to go forward here, but good feedback gives us lots of energy," states Elisa. "We have quite a lot of gigs in the autumn and it has been annoying me that we only had that demo CD to give away, so why not make a proper CD? You can really promote your band and sell the CD, so the question is, 'Why didn’t we do it before?' It felt like now we have the type of songs that we would really want to put on that CD. The situation in the music industry isn't so easy for this kind of music," notes Elisa. "The mainstream is so narrow," adds Arto. "I think that the internet is good for our kind of music because this kind of music finds an audience; people will like it, but they first need to know about it and have the ability to hear it somewhere. I don't just write and sing in English because it gives you possibilities to have an audience outside Finland, but it somehow feels natural to sing in English," explains Elisa. The gig at the Tavastia Club in Helsinki is part of the Irish Festival in Finland and Elisa Laiho Acoustic Flow have been asked by Olli Pelikka, President of the Irish-Finnish Society, to perform because they wanted something a little different from the world-renowned Dervish, the headlining act of the festival. Arto, Lissu and Elisa will offer something different and the only concern will be if Dervish has the nerves to follow their performance. "One last thing…Everybody buy our CD single...it's excellent and come to Tavastia. Anything else? Hmmm, we love you!" Elisa's final words are drowned out by a chorus of laughter. CLICK HERE TO DOWNLOAD: "Love is Like a Breeze"
CLICK HERE TO DOWNLOAD: "Senses of a Mistress"